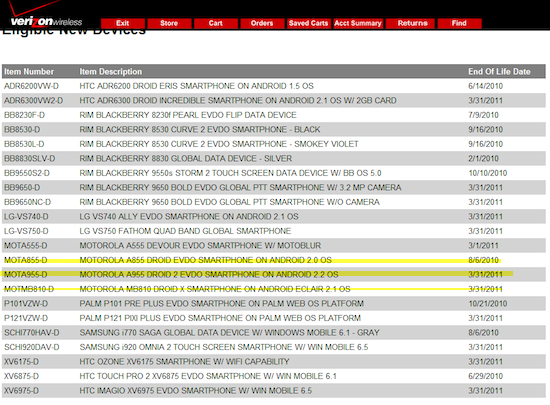 A new “end of life” device list appeared late yesterday afternoon and features specific dates for every major Verizon smartphone including the new Droid 2 and Droid X. Don’t worry just yet though, the date given to both devices is 3/31/2011 which puts both out of commission about 8 months after their release. Wait really? Seems a little early right? The original Droid at least lasted 10 months before being taken off the market. Speaking of the original, it is also listed, only with an 8/6/2010 date which matches up perfectly to our report almost a month ago. Have any thoughts on seeing an “end of life” date only a few weeks after the release of your brand new phone? We knew 4G (LTE) devices were coming and that devices have shorter lives than ever these days, but this news can’t be exciting you. Am I right?